Angela joined AEC as a receptionist in 2017. She was a double major from the University of Findlay (Ohio) in 2009 with a Bachelor of Science in Equine Studies and a Bachelor of Science in Equine Business Management. Prior to joining AEC, Angela managed a 60+ horse facility for over 5 years. Most of her veterinary experience came from helping to coordinate with owners and providers on required veterinary care needed by the stable of horse athletes. Now Angela does a great job helping our AEC customers and their pets when they come to our hospital. "Animals are a very important part of my life and I know that most people who bring their pets in to AEC are people who think of them as part of their family. 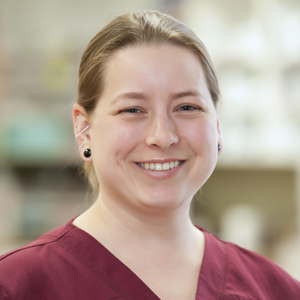 AEC understands how important animals are to the people who love them and I'm glad to be a part of the team here!" Angela currently has two rescue dogs, one of which is a universal blood donor that will help out if there is a case that needs him!